Road trip! We love road trips. I, Zeb the Duck and Soapy Smith Duck are in the car, waiting for our moms. Like many road trips, there is no rigid schedule. We are not sure where we are going or when we will return. 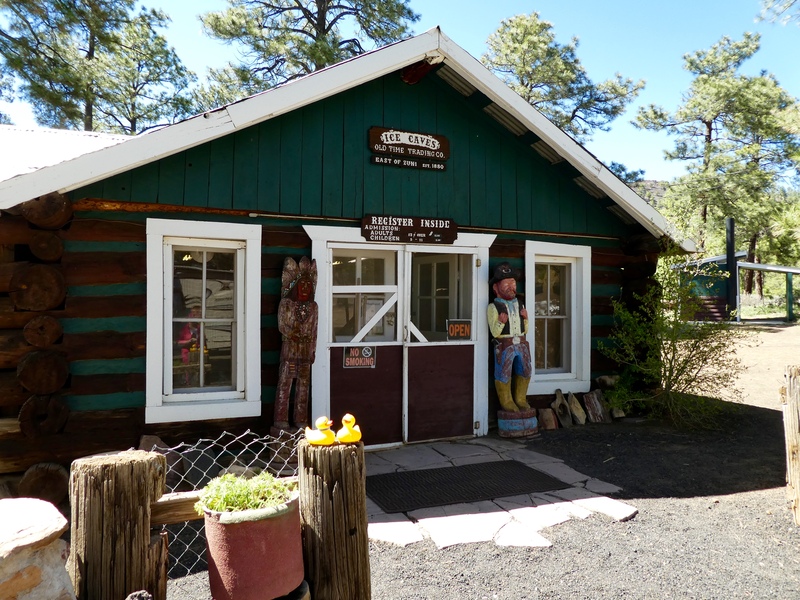 Heading in the general direction of the Grand Canyon, but wanting to see things much different also, from Denver we head south on I-25. 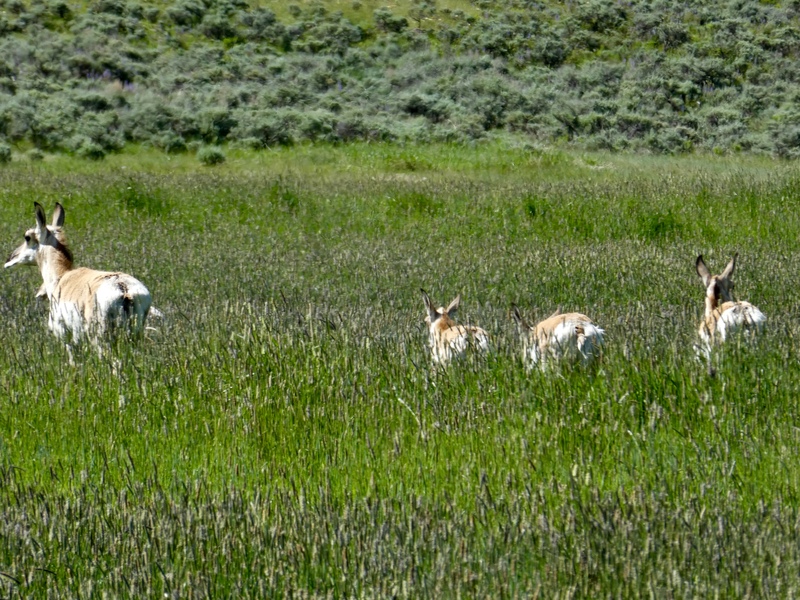 Along the way we see several pronghorn, or American antelope. We often just call these animals antelope. They are the second fastest animal in the world, behind the cheetah. Of course, they are the fastest animal in North America. These animals appear so delicate and graceful. We love them. In Albuquerque we leave I-25, heading west on I-40. This is still rather high in elevation and somewhat mountainous, so the heat is not a problem. We are near Grants, New Mexico. Let’s go to the ice cave. We were here in March 2016, but we want to see it again. The ice cave is located on the Continental Divide. Inside we pay our fee, get our map and look at the museum stuff. 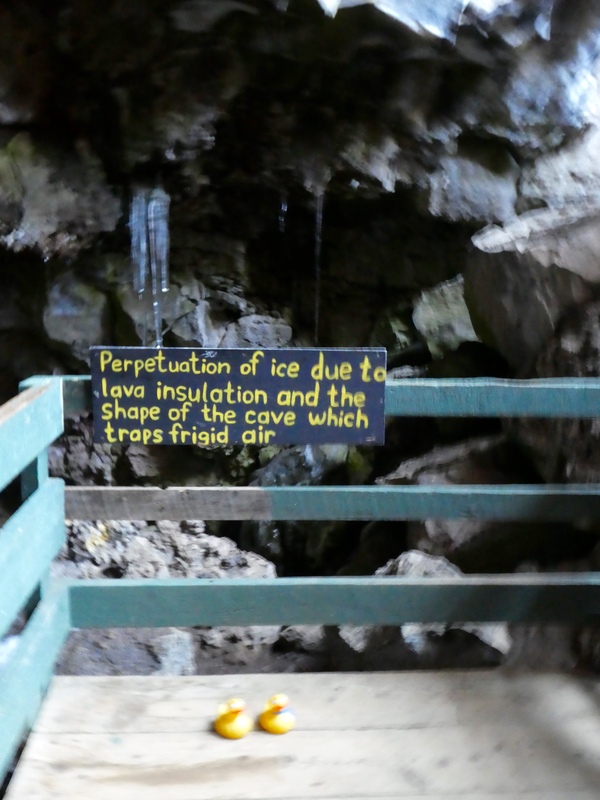 There are several dormant volcanos in this area of New Mexico, and the ice cave is inside a partially collapsed lava tube. As we walk to the cave, we admire this old, twisted tree. 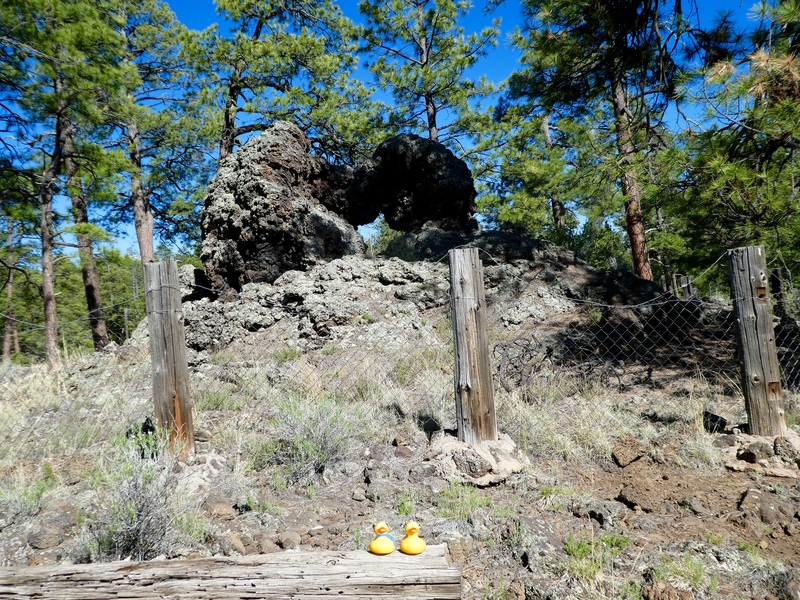 Ducks sitting on twisted tree with old lava behind and to the right. And we rest for a moment here. Ducks have short legs you know. Last year we showed you some of the things along the way, so we won’t repeat it. Now, down 70 stairs to the ice cave. Down the stairs to the ice cave. And still more stairs! Photos are difficult here for mom, but this ice is deep and old. The temperature dropped as we reached the bottom of the stairs. There are two levels to see the ice, probably less than 10 feet apart, but the lower level is much colder. This ice is about 20 feet deep. The blue-green tint is from the natural Arctic algae. 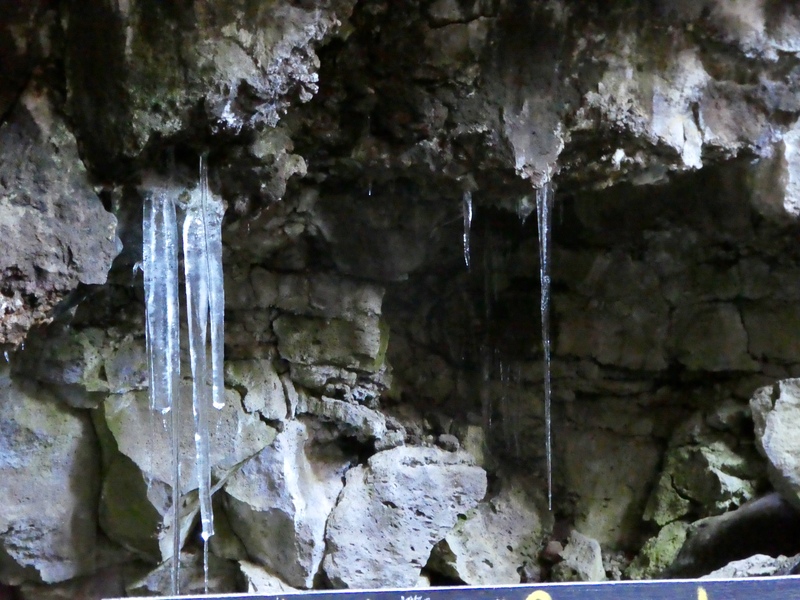 The oldest ice is on the bottom, and is from 1100 A.D. That is old! New ice is added each year from rain and melting snow. We love icicles. Especially in the summer. I don’t remember this sign from last year, but it explains a little about the ice never melting. The temperature here on the ice never gets above freezing. 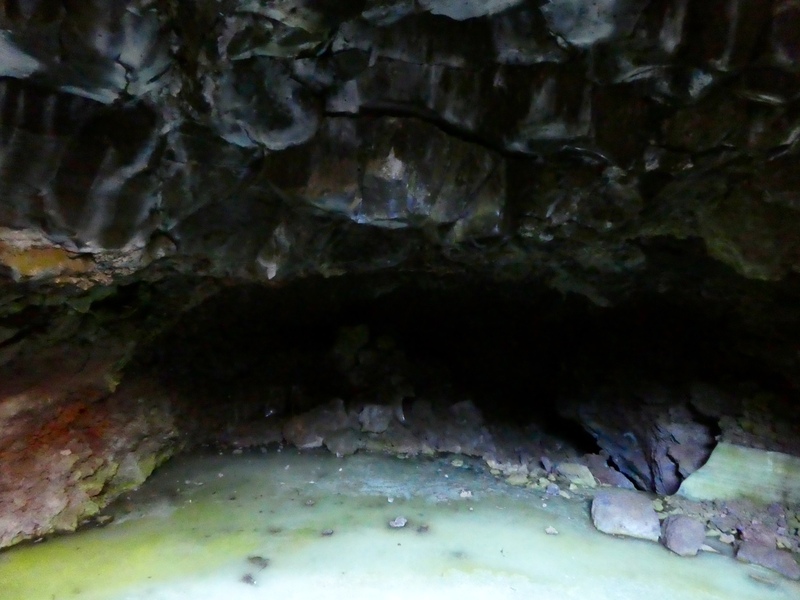 The lava tube is partially collapsed, so we can see outside. We like this place. If we are in the area again, we will probably stop again. 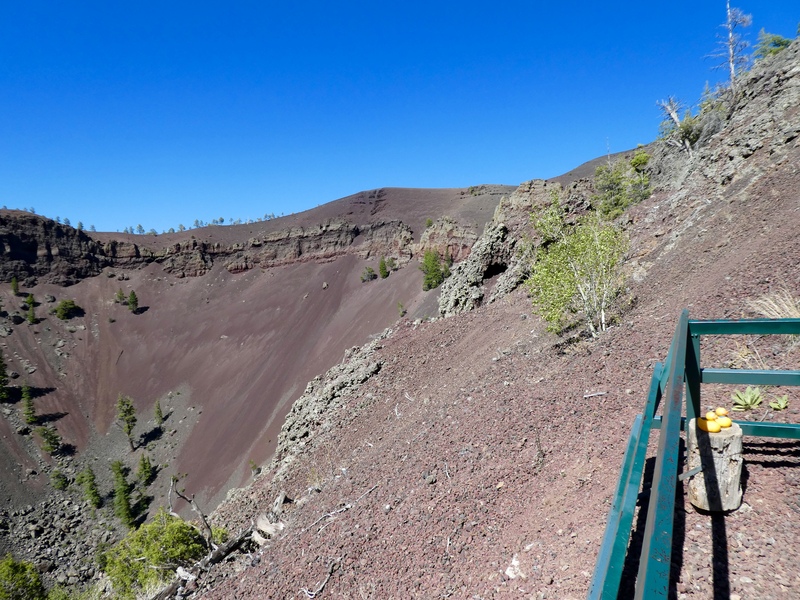 March 2016 was colder and windy when we were here, so we did not hike to the top of Bandera Volcano. But today is nicer, so up the hill we go. We pass this lava formation. Continue climbing on the path, we reach the top of Bandera Volcano. The elevation here is 8,122 feet. 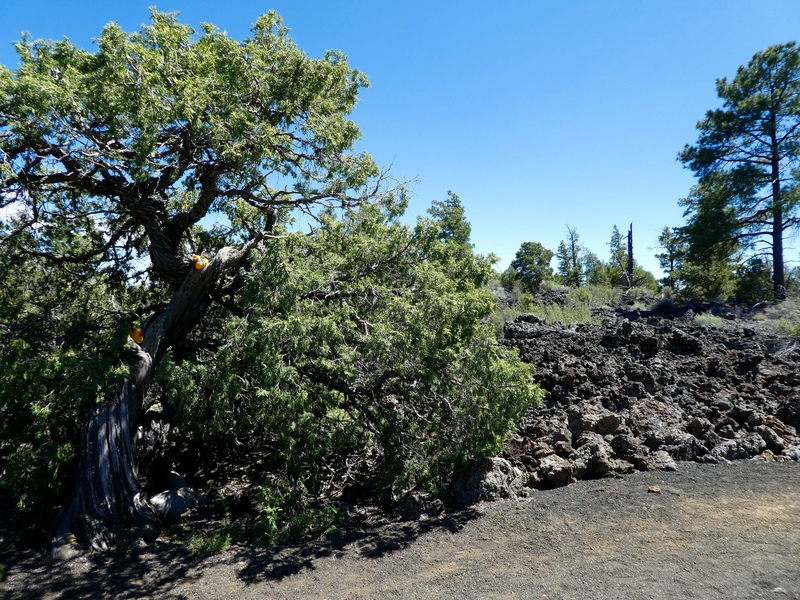 This volcano erupted about 10,000 years ago. The crater is well preserved. It is about 1,400 feet wide and 800 feet deep. 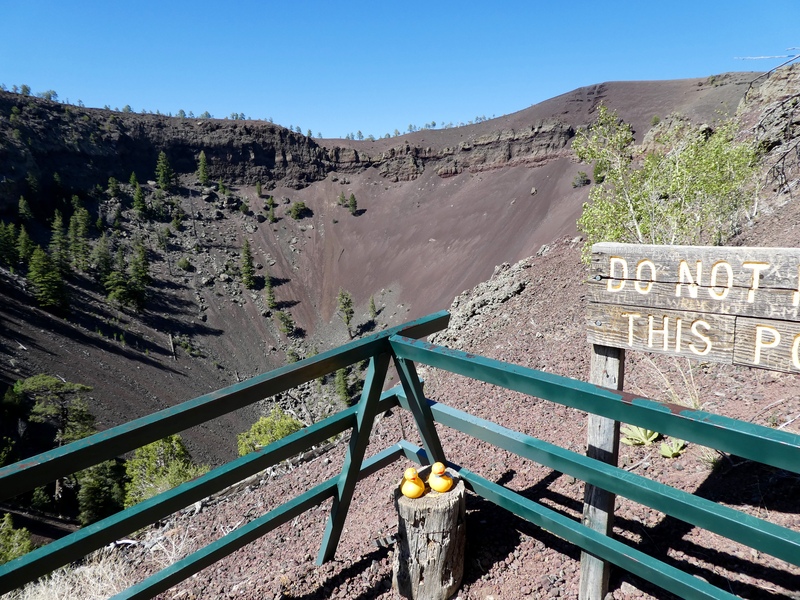 This is considered a fragile environment as rocks and other items slide into the crater. On mom’s phone it indicates we climbed 18 flights of stairs to reach the top of the volcano. The path was gentle so we enjoyed the climb. 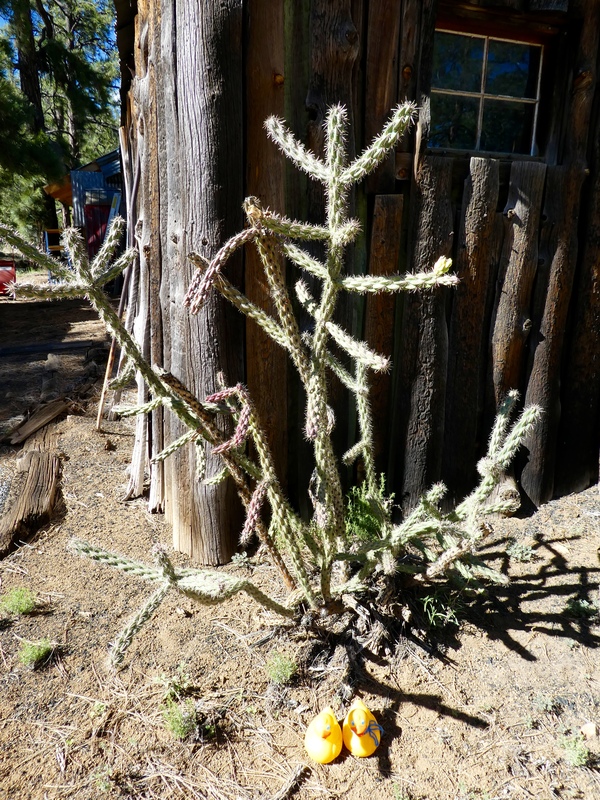 Back down near the tourist store, I liked this cactus growing by the old shed. And look at this gas pump. Old gas pump. They sure look different now. 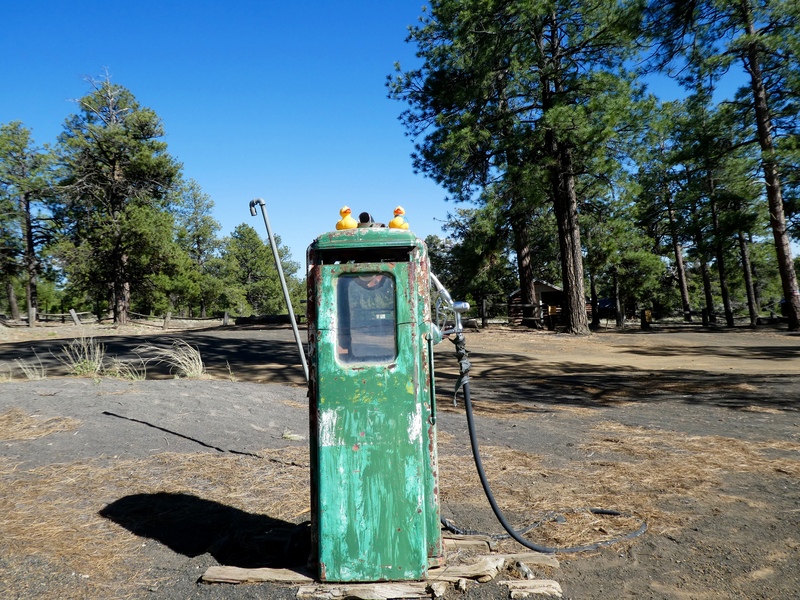 Today’s gas stations and gas pumps certainly look different. This is great place to hike and see different things. For more information visit http://www.IceCaves.com We think you would enjoy stopping here when you are in the area. We continue driving west on I-40. Stay with us to see where we stop next. 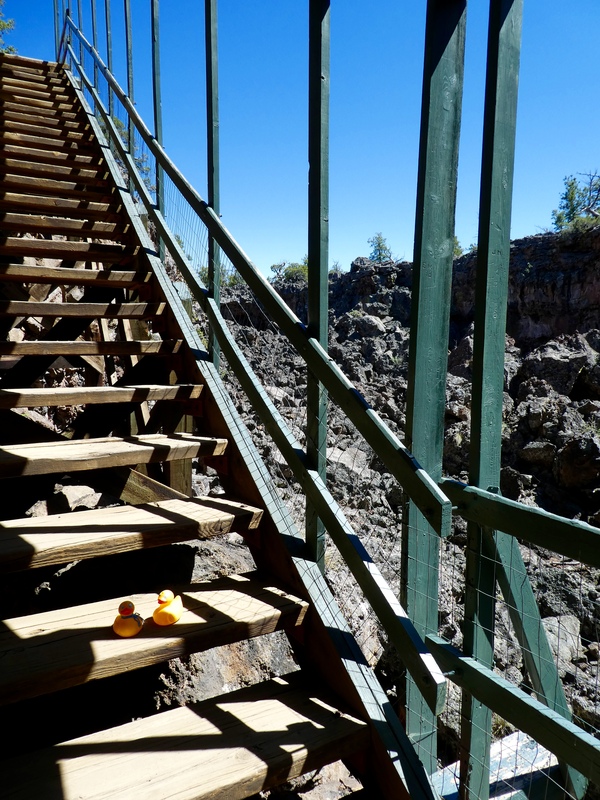 This entry was posted in Colorado, New Mexico, Uncategorized and tagged Bandera Volcano, Colorado Traveling Ducks, Grants, Ice Cave, lava tube, New Mexico. Bookmark the permalink. How interesting to see that ancient ice and a volcano too. I envy you having no deadline for your road trip. This trip was so unplanned that we just wandered and enjoyed so much along the way. Really a great way for us to travel and explore things as we found them. Often just read billboards along the highway and followed the directions. We really enjoyed our time away from home.